Saying Thanks is a sign of good manners and acknowledgment of goodness. We feel great when someone wishes us or congratulates us. And thus, to provide them with equal respect and goodness, we should thank them. Saying Thanks to people empowers the act of compassion between two people. Responding to people who congratulated you shows your appreciation, your obligation towards them. This significantly helps in endowing the generosity in you and the giver. No matter in which field you are working, you always give your personal referrals and receive thanks from the person. It is a really powerful word which helps in making powerful and stronger relationships. 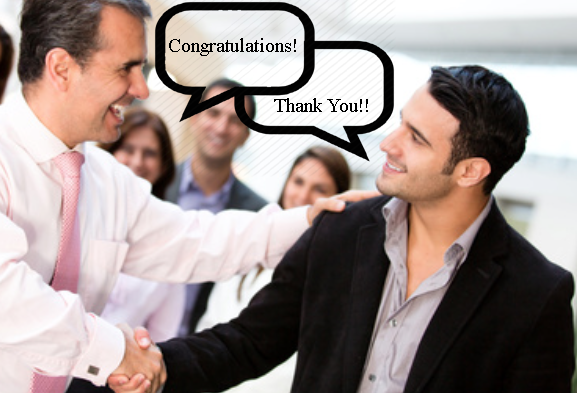 There are innumerable situations and reasons when people congratulate you. These moments include a new job, admission to a dream course, job promotion, marriage and much more. Not only you people, but everyone gets confuse about how to say thanks for the congratulations. So, this article is for those people who are looking for the words to thank you for the congratulations. It will help you in finding the best messages for the occasion. Thanks much for thinking of me. I feel glad that I received your blessings. Thank you so much for congratulating me on my graduation. I am grateful that you helped me throughout. Your wishes and blessings worked. Thanks for recognizing my efforts. My luck stood by my side. Thank You. Thanks for dropping your blessings. I am surprised to see your email. Thanks. We appreciate it. Thank You for congratulating us on our wedding. Thank you so much for extending your blessings. I am humbled by your gesture. Thank You for sending me your congratulations. Your support helped me. Thank you for sending a message on my graduating day. I have just received your congratulatory note. Thank you so much for your wishes on the first birthday of my baby boy. I feel great receiving your congratulatory letter today. Thanks much for your support. Like these situations, there are many more reasons when you should respond with a thank you. And there are numerous ways to thank you as well. Like, you can use quotes for the people who congratulated you. You can send messages or letters as well as poems too. You just have to sound genuine with your thanks because it is a word which gives the person a good feel. You just have to keep yourself specific with the words and use the person’s name in the message to make it look more meaningful. Choose the perfect words in your thank you message. You just have to be confident while responding back. Receiving congratulatory messages from your loved ones makes you feel great because you know that it is their support which helped you in achieving success. So, now, it is you who have to let them know how you feel with your gratitude. Responding with Thanks changes a life because you get a smile on your face while saying thank you and that smile can change the world. Saying Thanks to people can do wonders.